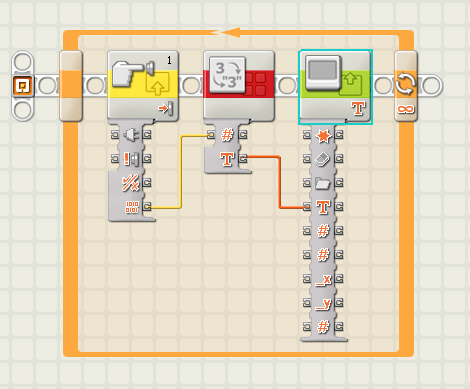 After posting Hacking the LEGO Mindstorms NXT Standard Motor, I received several requests for more information regarding the wiring of the motor. The WHITE and BLACK wires (Motor 1 and Motor 2) deliver power to the motor. If standard batteries are used, the potential difference will be 9 volts, otherwise the NiMH rechargeable batteries provide 7.2 volts. 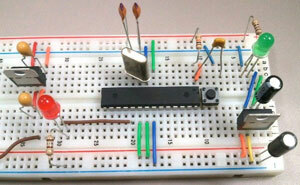 If the white wire is positive and black is negative, the motor will turn one way. If you reverse the polarity, the motor will turn the other way. 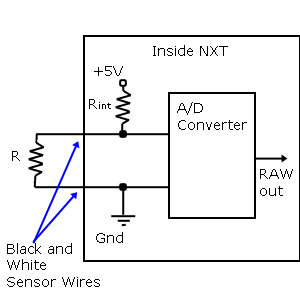 The RED wire is connected to the ground (GND). Note that in the sensors, RED and BLACK are connected to one another. This is not the case in the motors. The GREEN wire is connected to the +4.3 NXT power supply. The YELLOW and BLUE wires are connected to the quadrature encoder, also called an incremental rotary encoder. As shown in the figure from Wikipedia above, (http://en.wikipedia.org/wiki/Quadrature_encoder) the wires return square wave pulses that are 90 degrees out of phase. If the rising pulse on TACH00 leads the rising pulse of TACH01 by 90 degrees, then the motor is going forward. If it instead lags by 90 degrees, the motor is rotating backwards. One complete square wave cycle corresponds to 2 degrees of rotation. In the diagram above, if TACH00 refers to A and TACH01 refers to B, we can see that the motor is going backwards as TACH00 is lagging TACH 01. By measuring the frequency of the square wave oscillation, one can compute the rotational velocity. Since one cycle corresponds to 2 degrees of rotation, one cycle per second (1 Hz) corresponds to 2 degrees/sec. If you record a frequency of X Hz, then the rotation rate is 2X cycles/sec. Note also that by tracking both square waves, you can identify quarter cycles, which gives you a resolution of 1/4 of 2 degrees, which is 0.5 degrees. The motor speed is controlled by pulse-width modulation (pwm), which works by driving the motor with a variable duty cycle square wave. This effectively turns the motor on and off, fast. The longer it is on, the more torque it will generate and the faster it will go. These details and more can be found in the excellent book: Extreme: NXT with a sneak peak here. It can be very difficult to figure out exactly how to store one’s LEGO parts. This depends greatly on the extent of your collection, and how mobile it needs to be. Below I offer a wide array of suggestions ranging from the size of one NXT set through tens of NXT sets with thousands of dollars of extra parts. Here I will review the solutions that I have found useful, and at the end I will provide a detailed description of my particular storage strategy. is secure and allows one to carry the box around without fear of accidental opening. 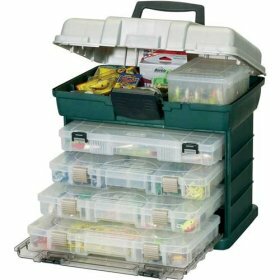 These utility boxes are also included in the larger Plano Tackle Boxes , which provides an excellent means of both storage and transport.The new Custom Divider Systems (CDS) give you a great many ways to divide each box into bins with the greatest versatility. The other divider systems work well, but this is a nice option. 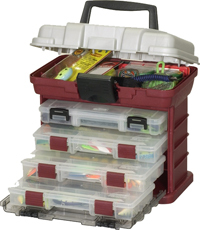 Plano tackle boxes are designed to hold multiple (typically four) utility boxes above. This provides for a readily mobile storage solution. Your LEGO collection can be carried from your home, to the lab, a friend’s house, or into the field at a moment’s notice. 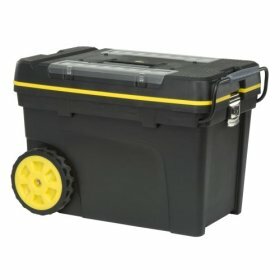 Here is a photo of my Plano 1364 Tackle Box that I use for most of my construction needs. I have found that the 1354 Tackle Box is a bit on the small side for even the smallest collections. You will be surprised at how many distinct kinds of Lego parts there are, when you find that they will never fit into the 9×4 compartments. 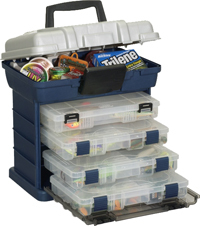 However, this tackle box can hold 4 utility boxes, and you often can put an additional box in the top compartment. fit in the tray resulting in 4×18 = 72 compartments. I also manage to keep an additional 3650 box in the top of the tackle box. I can often work with just this subset of my collection. In addition, it makes travel easy. 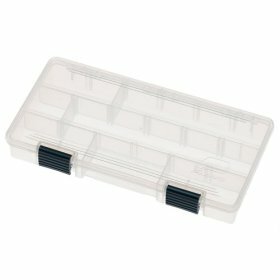 This tackle box can hold a large number of parts. The top bulk storage compartment is sufficiently large and deep to actually hold smaller robots! 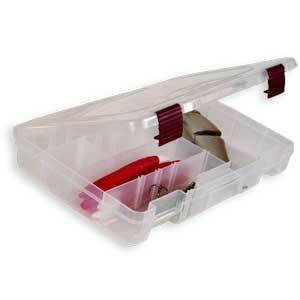 The 3750 size utility boxes are very spacious, and this tackle box comes with one of the newer Custom Divider System (CDS) utility boxes, and one flip-sider, which is good for fishing tackle, but not so useful for LEGO parts. For this reason, you may need to buy an extra 3750 box to replace the flip-sider. And you may want an extra 3750 to fit in the top compartment. For a more extensive LEGO collection, one may require more storage space for small parts, such as pins, axles, etc. 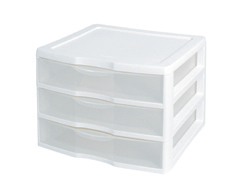 Akro-Mills makes some very nice organizers with a large number of small drawers. Drawer Size: 4.25″ W x 5.25″ D x 2.0″ HI have three of these. One holds all of my pins and connectors. The second holds all of my axles and axle connectors, and the third holds all of my gears. The larger collections require more extensive storage. Storage bins with drawers are excellent for storing large numbers of bricks of many colors and types. Stackable bins with drawers facilitate organization and access, although they require a good bit of space… or rather, your collection does! 14 5/8″ L x 14 1/2″ W x 10 5/8″ H.
Stanley Consumer Storage 033023R Pro Mobile Tool Chest. 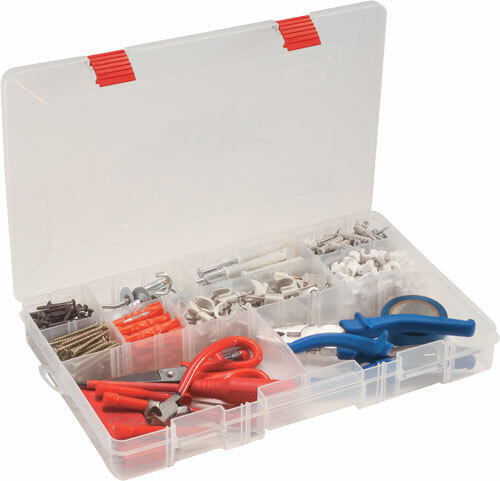 6 small Plano 3500 compartment boxesThis is in addition to the large top tray that can hold Mindstorm NXT bricks, a great deal of cabling, and other tools that you might need.The tool chest has a handle and wheels, which makes for easy transportation. See the more recent posts: COLORFUL LEGO STORAGE IDEAS and New LEGO STORAGE OPPORTUNITIES for more ideas.